Home Food Raw Food – the Healthiest Way to Live on Our Planet! A healthy raw food lifestyle is one of the greatest ways to live on the planet! All you have to do is eat live, raw, unprocessed food as much as possible. When about 75% of your meals are raw and vegan you are officially a raw foodist. At that level your body can eliminate the toxins in the cooked portion of the food that you eat. If you eat more cooked and processed food you can’t eliminate all the toxins so they can build up — causing disease. Cooking your food over 118°F will destroy the important enzymes and much of the nutritional value of your food, actually creating chemical changes in the food creating carcinogens, mutagens, free-radicals and other toxins. These are the toxins which are linked to all our modern diseases like diabetes, arthritis, heart disease and cancer. All the life-giving chemical reactions in your body only happen when electrons can flow freely between atoms. Cooking and food processing causes everything you eat to actually lose electrons! So cooking and processing actually “steals” electrons from your body. We call these reactions “acidic” or “oxidizing.” Live raw foods, on the other hand, contribute electrons to your body. 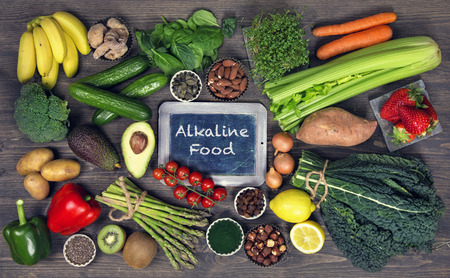 Adding electrons to a chemical reaction it is called “alkalizing.” We use the pH scale to measure just how alkaline or acidic something may be. But the pH scale is logarithmic — a tiny fraction of a point can create huge changes in your health! You see, key reactions in your body only work within a narrow range of pH. For example, if the pH of your blood falls to the low end of its normal range (~7.35-7.45), just a tiny a .10 difference, it lowers the oxygen in your blood by as much as 300%! Compassion is at the center of a healthy raw food vegan lifestyle. You see, a raw, vegan lifestyle is ultimately a spiritual or ethical choice…not just a nutritional one! As a result, many vegans I meet are somewhat radical about what they believe is the end goal — and have little tolerance for anyone that espouses anything short of stopping all consumption of animal products immediately. Raw, uncooked food also helps with weight loss and prevents many modern diseases of civilization. Many medical studies have shown great health results with this lifestyle while protecting all the other beings on this planet. Remember — take the time you need to learn everything you can about raw food so you can truly appreciate it! It’s truly is a magnificent new lifestyle if you take the time to do it right. Give yourself enough time to let go of old habits and be compassionate with yourself. If you feeling a bit weak, like a touch of the flu, you’re probably detoxing — just slow down a little while your body adapts. Learn more about cleansing if you want to speed things up. A healthy raw food lifestyle is actually one of the easiest ways to eat once you understand the basics. To start, try eating just 75% raw — just make sure that 3 of your meals are mostly raw. There are 4 meals in a day — lunch, breakfast, dinner and your snacks. Start the day a raw smoothie for breakfast instead of eggs and toast. A raw breakfast gets you started with healthy, nutritious foods rather than toxic-loaded foods like coffee. In fact, see if you can eliminate all your wheat and caffeine completely. For lunch enjoy a fresh live salad or healthy green juice. Never stuff your face with anything, even a salad! It’s best to eat only when you’re actually hungry. For dinner have whatever you want along with a nice raw salad. Always remember to cut out all the sugar (especially corn syrup), wheat products (or anything with gluten), anything “hydrogenated,” and salt (including MSG). Snacks are your 4th meal. Keep fruit, nuts or “raw” crackers at your workplace for snacks throughout the day. Or have an organic apple handy. 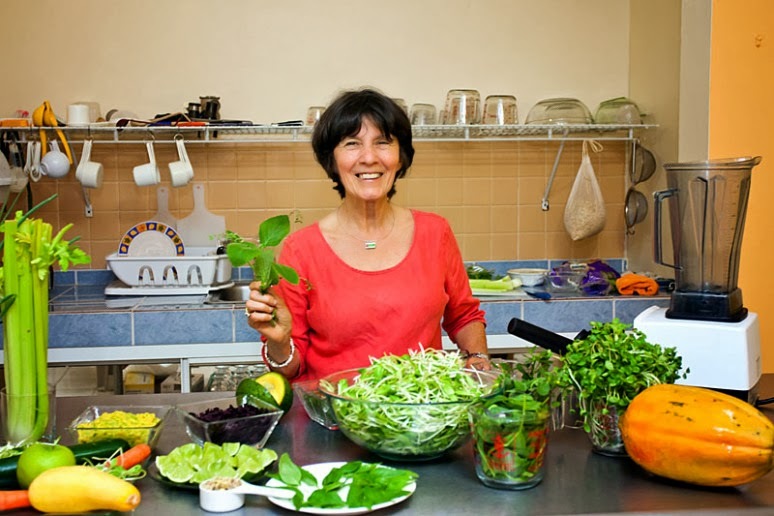 You see, a healthy raw food lifestyle doesn’t have to be complicated or expensive! It’s actually a lot cheaper to eat fresh, raw foods since they are more nutritious. Over time you may actually find yourself eating much less and feeling much better! While it’s not required for a raw foodist, it can really help a lot to buy a good quality high-speed blender as well as a slow-speed masticating juicer. However, if you are on a budget then all you need is a good knife and some new, healthy recipes! You can get most of what you need in the health food section of your nearby market. You can also use a produce delivery service available at many supermarkets. If you have any local CSA farms (Community Supported Agriculture), you can also get great food delivered to your door. Remember, always to your best to buy organic food! Commercial produce can be loaded with toxic pesticides and genetically modified organisms (GMOs). The big thing to note is that organic food is up to 300% more nutritionally dense than commercial produce. Your body will eventually learn to absorb this extra nutrition so you’ll eat less, thus reducing food costs even for organic food. Without all the empty calories and toxins in your food, your health care costs can go down. — perhaps to nothing! Raw food eventually helped me lose 75 lbs almost as an after-thought! Over 170 delicious recipes show you how and make going raw easier than ever … without sacrificing taste. 104 pp. Special sections: Recipes for the Holidays & Raw Food for Pets. FREE download with any purchase over $100.00.